Barbara Dickey, 94, longtime resident of Henryetta, passed away Tuesday, March 12, in Henryetta. Barbara was born Dec. 24, 1924, in Sapulpa to Ernest Grant, Sr. and Lila (Rhodes) Grant. Barbara worked as a medical records technician for Dr. Carlton Smith at the old Henryetta Hospital. She was a member of the Episcopal Church in Henryetta until its closure and was currently a member of the Dewar First Baptist Church. Barbara was preceded in death by her parents; her husband, Jeremiah Hamilton “Jeff” Dickey; granddaughter, Amy Rhodes; brother, Jack Grant; and two sisters, Fern Harris and Phyllis Files. 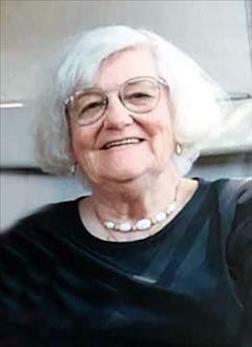 Barbara is survived by a son, Jerry Dickey and wife Blanche of Henryetta; a daughter, Sheryl Rhodes and husband Bruce of Owasso; two granddaughters, Ginny Parker of Henryetta and Laura Meerholtz and husband Paul; five great grandchildren, Zachery Dickey, Bella Parker, Bentley Parker, Sterling Meerholtz, and Jade Meerholtz; a brother, E.F. Grant Jr. of Witchita Falls, Texas; as well as a host of friends and other relatives. Funeral services will be at 10 a.m. Saturday, March 16, at Integrity Chapel. Interment will follow at Westlawn Cemetery under the direction of Integrity Funeral Service. Subscribe and see the e-Edition of the Henryetta Free-Lance for the complete story.